There are fears that even at this early stage, the market for virtual reality (VR) media is fragmenting, explaining the urgency with which the new VR Industry Forum (VRIF) wants to establish voluntary guidelines for what a high-quality VR experience should feel like and how to create, distribute and protect it. The organisation was officially launched at CES earlier this month and we should see some of its voluntary guidelines, describing best practice, published this year. The Forum operates worldwide and is already active in Europe, with TNO, the Netherlands-based organisation for applied scientific innovation, among the founding members. Rob Koenen, Principal, Networks at TNO, and Secretary at the VRIF, stresses the importance of establishing a great user experience from the outset for services the Forum is concerned with – namely live and on-demand video from the television and studio ecosystem that can be seen through VR headsets or on 2D devices like tablets. “If consumers have a miserable user experience, VR will fail before it even gets started,” he warns. Thus, one of the subjects the VRIF will be studying is motion sickness. Accessibility is also on the agenda at this early stage – following through on the commitment that VR should be for everyone. The VRIF is also open to everyone, and after a closed-door meeting for the 28 member companies at CES (at the Caesars Palace hotel) there was an open session attended by over 60 people. New members have been signing ever since. Founder members include CableLabs, Ericsson, Harmonic, ARRIS, Akamai, Dolby Laboratories, DTG, EBU, Fraunhofer, MovieLabs, Sony Pictures, Sky, Viacess-Orca and Technicolor. 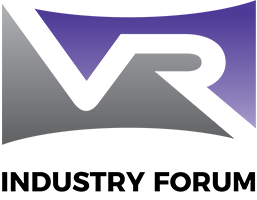 The VRIF advocates “voluntary industry consensus around common technical standards for the end-to-end VR ecosystem, from creation to delivery and consumption”. The aim is interoperability but the organisation will not be developing standards itself, leaving that to standards defining organisations (SDOs). Several of the European members were at an MPEG meeting this week and MPEG’s Omnidirectional Media Application Format is of immediate interest. VRIF is confident that the market could consolidate around this format and Koenen expects the format to be ‘called out’ in the VRIF guidelines. Production – how to produce content – covering cameras, 2D/3D, file formats, frame rates, interfaces, storage and archiving. Distribution – broadcast; unicast; LTE broadcast; 5G; CDN caching, etc. Decoder/Display – rendering techniques; resolution; frame rate for display device, etc. Human Factors – motion sickness, vertigo; impact on human balance; vestibular-ocular reflex, etc. Security – encryption including CENC support; support for transformations in secure media path in players and devices; verification of source and integrity of content, etc. Content protection is high on the agenda and will have its own workgroup. As Koenen notes, the industry wants to monetize VR and make it a viable business. Meanwhile the ‘to do’ list at the VRIF includes each working group writing its own charter, which the members must then approve, and creating a dictionary of terms that can help the whole industry use a common vocabulary when discussing audio-visual virtual reality. The VRIF has been formed by converging two parallel informal initiatives, one headed by the DTG and Harmonic (who convened a meeting at CES 2016 focused on fragmentation) and the other headed by Ericsson (addressing similar concerns but initially focused on the use of 5G). These three companies/organisations then organised a dinner at NAB 2016 (also in Las Vegas) where 40 companies discussed cross-industry collaboration. A ‘VR Interest Group’ was born and at IBC the decision was taken to morph this into a more formal organisation: the VR Industry Forum. You can find more information about the VRIF initiative at www.vr-if.org.